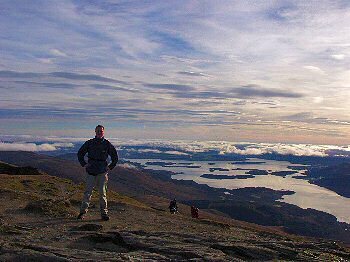 Ministry of Propaganda - 08/Dec/2003: "Back from Scotland"
On Friday it was time for some "Munro bagging" as I made my way up Ben Lomond. From Rowardennan at the shore of Loch Lomond I walked up to the summit with great views into various directions. After a grey and dull start to the day the weather brightened up and I had sunshine for almost the whole time I was out. I met several other walkers, luckily it wasn't too crowded any more. 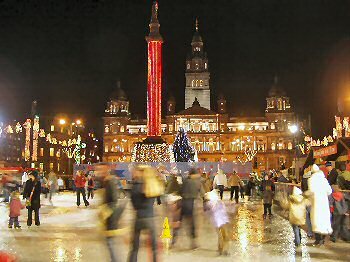 I guess during the summer this must be a very popular spot for walkers, especially as it is very quickly reached from Glasgow. Despite being slightly stiff from the walk the previous day I decided to do some more walking on Saturday. 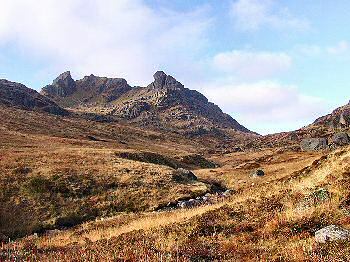 This time my destination was Ben Arthur, better known as The Cobbler. Walking up from Loch Long I walked along the Buttermilk Burn (no idea where the name comes from) past the Narnain Boulders (you can just make them out on the right on the picture left) until I reached the three summits of The Cobbler. Again the views were fantastic, despite it being quite hazy. Across Loch Long and Loch Lomond I could make out Ben Lomond, where I had been the day before. To the other side the various summits of the Arrochar Alps were clearly visible with others hiding in the haze in the distance. 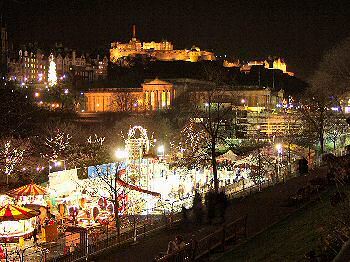 On Sunday it was time for a different activity, this time I took the train to Edinburgh for some Christmas shopping and a visit to the Christmas Market in Princes Street Gardens. Especially once darkness fell in the afternoon the lights with the castle in the background were quite impressive.